Before I graduated from the university, I used to be a T-shirt person. 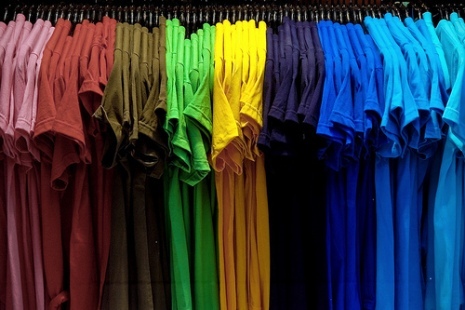 For me a T-shirt could represent my daily wear as I cleaned house, it could become my pajamas for the night and throwing on a pair of jeans with it made it my run to the salon or ‘anywhere’ outfit. While shopping last week for clothes, I found a T-shirt that had a “Under Construction” sign and said “Be patient with me; I’m under construction, and God isn’t finished with me yet. What an impression it made on me! I thought about my walk with God. How true! I am still under construction. Even though I am made in His image, I don’t always reflect that in my day to day walk with Him. Scripture says that I am to put off the old man and put on the new man. In other words I am to take off my old pattern of life and to clothe myself with a Christ inspired life. I am renewed only as I let the Holy Spirit transform me and it has to start in my mind. God knows that it takes time and patience, He knows that I am a work in progress. What’s so great about Him is that His patience, grace and mercy, along with the fiery trials that I sometimes find myself in comes through His love for me. I realized that in His eyesight I am special and He is patiently molding me. Because of that love I don’t want to disappoint Him. Yes, He is still working on Me. 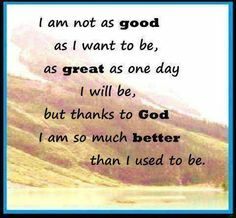 I am not perfect but I know I am not what I use to be, and for that, I want to thank Him for the growth that I am seeing. Posted on November 30, 2014, in Dear Jesus and tagged Christian living, God, Grace, Love, Mercy, Perfection, Thankful's work in Progress, Under Construction. Bookmark the permalink. 9 Comments. Beautiful piece Ezar…we are all works in progress. I am a work in progress. I am surrendering my will to the Father. He is molding me to his creation for his glory. His artistry is priceless and effortless but necessary in my growth. I was once bound to society, family, friends, and people but through him, I have found freedom to soar as an eagle. He is my only judge but I am to follow him and lead others to him. Good morning darling Ezar. I agree with this. Becoming like Christ is a long, slow process of growth. Spiritual maturity is neither instant nor automatic; it is a gradual, progressive development that will take the rest of your life. We can’t try to put duct tape on all of our weaknesses and think that on our own we can make progress happen. On our own, we are only helpless sinners who never meet the standards set for us. Only through God’s will can we do what we were made to do. This is something I have had to wrestle with for a while. I’m not ashamed of my overly competitive, hardworking perfectionist attitude, but it gets me in trouble when I simply can’t do everything I think I can. I have to realize I’m only as good as God wants me to be right now, but I have to keep the faith that His plans will ultimately be far greater than mine. I can do my best with the opportunity and ability He has given me now and trust Him with the future I can’t see. I am a girl that thrives on organization, routine and order in my life. It is called being a control freak and I am very good at it. In the Gifts of the Spirit, it would seem that I flow in the gift of administration. Sounds very boring to me. However, when I am thrust into a situation of chaos and disorder it is my natural instinct to put it all together. Like unraveling a jumble of power cords and systematically plugging them all in one by one until whatever I am doing or wherever I am runs smoothly and routinely. When I am faced with the uncertainty of life, it is my comfort zone to bring some semblance of order. This is a huge advantage in my position as a supervisor but sometimes hinders me as a friend. Life lived in a strict and rigid routine does not foster a spirit of love and forgiveness, but rather right and wrong. There is a right way to do things and a wrong way as well. My way is not always the best way for others even when I am convinced it is the only way for me. There is no doubt that Type A personalities like myself are highly productive people but do they prosper? God’s Plan and Purpose for my life is not only to be successful in everything that I do according to His Word but to establish a holy, dedicated, consecrated priesthood with my life offering it to the Lord as a living sacrifice (Romans 12:1) which is to follow the example of Jesus Christ. The only way that I will be able to do that is to believe in Jesus Christ, adhere to, trust in and rely on Him. Those who do will never be disappointed with the finished product or put to shame by the end result of their life. It is time to examine the foundation of our life and make sure that we find His Name. God’s Plan and Purpose for our life is alive and well. He is just waiting on us to approve His Plan and work it. Once we do the impossible is suddenly possible and no longer are we frightened of the storm but stand strong through it. 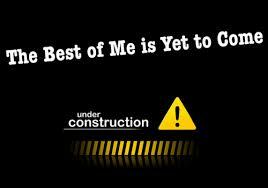 Yes, my life is under construction so please pardon my mess! For years my heart has been “Under Construction” as my Heavenly Father has been remolding me and making me into His image. Because of past hurts, it’s been my nature to keep people out. NO ADMITTANCE, NO MERGING, NO YIELDING. The impenetrable wall around my heart has only allowed a chosen few into the inner-sanctum of my true feelings and emotions. A lifetime of rejection and abandonment isn’t likely to be an overnight fix-it project, but one that requires years of “re-construction.” Over the years, God has been chipping away at that impenetrable wall around my heart, refashioning and repurposing my brokenness, allowing others to slowly “merge” into my lane of isolation. He’s changing my heart to allow others in while re-constructing me to have compassion for other hurting people. It would be easier to post those “DANGER! NO ADMITTANCE!” signs around my damaged heart, but I know that it’s not God’s will for me or for any of us to live isolated and alone. ALL of us have hearts that will forever be “Under Construction” until the Lord calls us home someday. The Vineyard encourages us to become part of a small group for the express purpose of surviving the construction zones of life. Our willingness to YIELD will certainly make the journey more enjoyable once we realize that not everyone trying to MERGE into our lives means us harm – sometimes they just need a friend. very true. a times we make the mistake to think we are finished. there’s still a lot to us we know not of. this is a powerful message. I hope to meet you soon. you’re doing a good job.